Gurit, a manufacturer of carbon fibre composite body panels for the automotive industry, is proud to congratulate its first automotive customer and technology development partner Aston Martin on its centenary year. 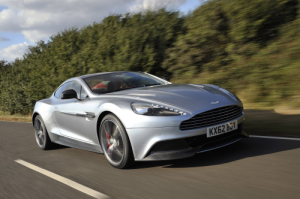 Gurit has been developing composite automotive systems with Aston Martin since 2003. It has been supplying Aston Martin with Class-A composite body panels since 2007 for the DB9, DBS, V12 Vantage Volante models and, most recently, the Vanquish, for which it manufactures the carbon fibre based Class-A composite front wings, bonnets, door skins, complete body sides and boot lids. “Over the last 100 years Aston Martin has established a well-deserved reputation for innovation and engineering excellence in the design and manufacture of its cars,” says Martin Starkey, Managing Director at Gurit Automotive. “The team at Gurit is extremely proud of what Aston Martin has achieved, especially in more recent years, with its use of advanced Class-A composites and we would like to take this opportunity to congratulate Aston Martin on this important milestone in its history.